Boeing [NYSE: BA] and Juneyao Airlines announced today the finalization of an order for five 787-9 Dreamliners, valued at about $1.32 billion at current list prices. Seen here is a rendering of the airplane in the carrier's livery. SHANGHAI, Feb. 16, 2017 /PRNewswire/ -- Boeing [NYSE: BA] and Juneyao Airlines announced today the finalization of an order for five 787-9 Dreamliners, valued at about $1.32 billion at current list prices. This new order, which also includes options for five more 787-9s, represents the Shanghai-based private airline's first Boeing order and first widebody airplane order. "Our strategic vision is to develop into an international airline that provides high quality service with an extended network, while ensuring excellent profitability," said Wang Junjin, Chairman, Juneyao Airlines. "Today's order is set to play a key role in our growing business in the years to come, and we look forward to continuing our relationship with Boeing into the future." Juneyao Airlines, one of China's largest private carriers, was founded in 2005 and started operation in 2006. It currently operates domestic routes and short-haul international flights to neighboring countries such as Japan, South Korea and Thailand. The carrier plans to open new routes to North America, Europe and Australia by 2020. "We are pleased to welcome Juneyao Airlines as a new Boeing customer," said Rick Anderson, vice president of Sales for Northeast Asia, Boeing Commercial Airplanes. "This order is an endorsement of their confidence in the 787 Dreamliner, which is the first choice for many single-aisle operators to start widebody operations." 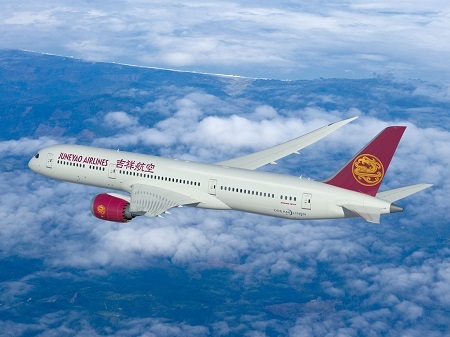 The 787-9 Dreamliner will deliver unmatched fuel efficiency to Juneyao Airlines, keeping the carrier competitive in this challenging economic environment. The 787-9 leverages the visionary design of the 787-8, offering passenger pleasing features such as large, dimmable windows, large stow bins, modern LED lighting, higher humidity, a lower cabin altitude, cleaner air and a smoother ride.